This art piece came about after a lecture that I attended on economics of all things. I was listening to the keynote speaker talk about the declining value of the dollar and it inspired me to think of what the worst case scenario would look like. I began imagining how it would look if civilization itself also began declining at the same rate. I imagined that there would be a nasty fallout-like fog over a major metropolis, bodies of water would dry up and be littered with the shells of abandoned ships. Those lucky enough to have survived the chaos would have very little left and would wander aimlessly, just surviving. I began the design with a picture that I found of a wrecked boat; it took hours to remove from its original background. After that, I began working on a landscape for the background. First off, a picture of a desert, then the addition of some clouds to cover the horizon line. A picture of Chicago from a distance, being overlooked by what would normally be the water. I hacked out the water, manipulated some things and a few design tricks later, I was set on the background. 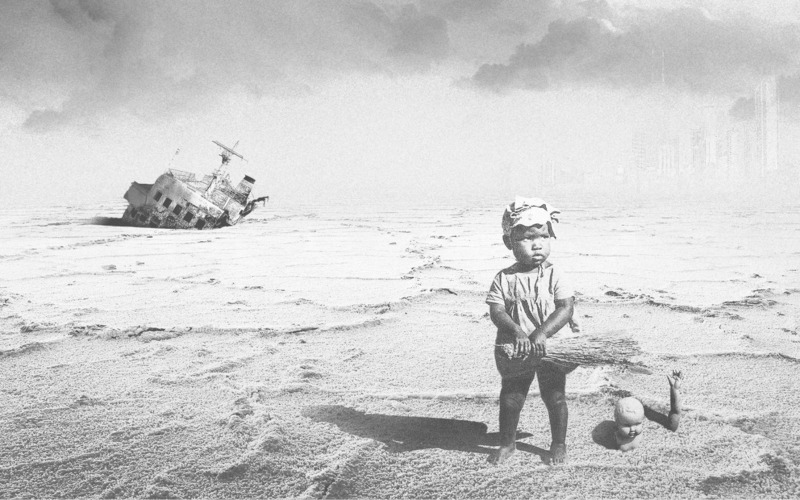 After adding in the picture of the boat that I extracted from its original background, I added some much needed shadows and a picture of the single loneliest looking child I had ever seen in my life. The final touch was to add a bit of "creepy." I added the hands and head of a doll that I thought looked really interesting, and just creepy enough to stay.